Market research studies are of little value if the people recruited to participate in surveys, interviews, or focus groups aren’t screened properly. Recruiting the most appropriate study participants who are qualified to bring insight to the business problem being explored is not something to be taken lightly. If your company skimps on this crucial step of market research, then it’s not worth the effort to complete the research project. Poorly executed recruiting is a recipe for disaster, as it misses the opportunity to capture respondents who are qualified and capable of fully participating in a study. Recruiting should be given as much a priority as any other in a market research study. Unfortunately, poorly executed B2B studies are not uncommon. The reasons are many. Sometimes it’s because B2B tech companies have only a vague sense of who their market research teams should talk with. Other reasons are research deadlines are unrealistic and so participants are hastily recruited. Getting a first-rate study necessitates focus and finesse. 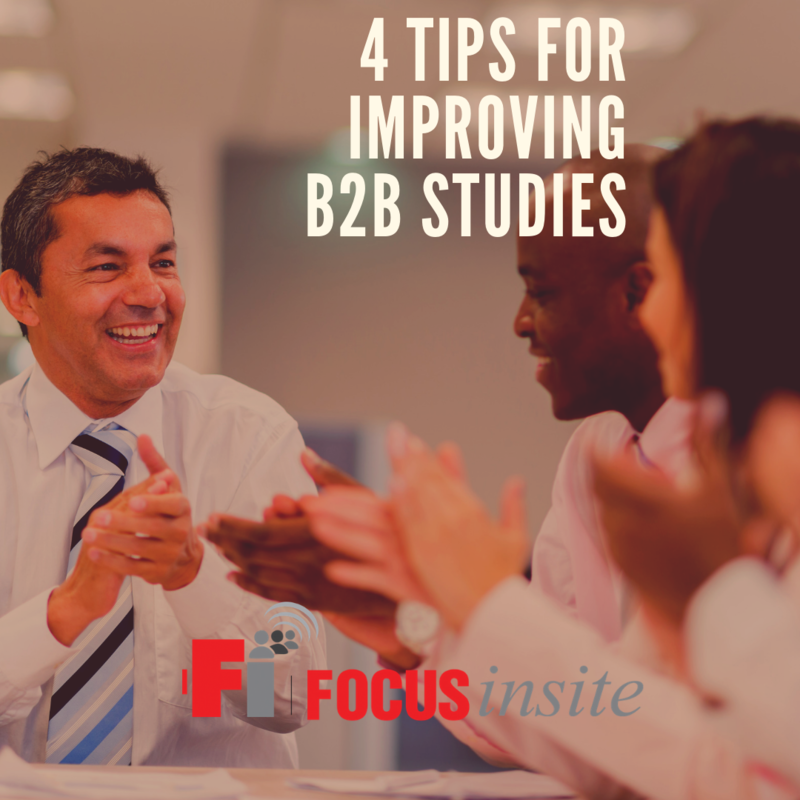 Finding appropriate respondents for B2B studies requires specialized, contextual knowledge of the industry. Think of it this way, just because two people may work for the same company doesn’t mean they have the same understanding of their employer. One could be a janitor, one could be a middle-manager. Context matters and drilling down to get the right person requires is time and energy well spent. Narrow it down. You’re not just looking for warm bodies to fill your study, you’re looking for qualified people. Spend the time to figure out who you need to hear from and then come up with a robust screening process to filter out participants who don’t meet the requirements. It’s not enough to say, “I want to interview bankers” and think you’ve identified your target audience. “Bankers” is a very broad category and includes, tellers, managers, loan officers, risk assessment officers, commercial specialists, and many other categories. Focus on the nitty-gritty. Similar to narrowing down a broad category, you want to get really specific when thinking of your target respondents. Within each category of a subject area are many sub-categories. Take our banking example again. Let’s say you’ve identified “commercial loan officers” as the group you want to target. Within that group will be many different sub-groups. Drill down within these many sub-categories to make sure you’re putting your energies into recruiting the right people with the experience that matters to your study. Know where to look. Professional recruiters are active across many channels, be it professional networks, social media, and trade associations. Once you’ve identified the group you want to target, the next step is finding them where they’re most likely to be active. Rarely are all potential recruits located in the same space. Often time you’ll need to cast a wide net across different channels to get to the ideal number of recruits for your study. Make participation worth their while. Your work isn’t done until you get firm commitments for recruits to participate in the study. Sometimes this step can feel like herding cats. Organization and clear communication upfront are your best bets at this stage. B2B market research studies are invaluable resources if executed properly. If your company has decided to embark on a B2B study, we recommend hiring a neutral market research firm that can guide you through the process from A-Z. Successful studies don’t happen by chance. They are well thought out, organized, and implemented. Recruiting for you study shouldn’t be rushed or brushed over. It’s an essential component.